Contract Catch allows you to upload a draft contract of your choice and of almost any length. 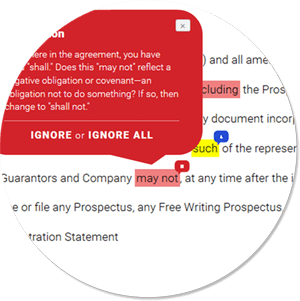 The Catcher will apply hundreds of proprietary rules to your document and will flag possible errors along with inconsistencies and troublesome language—everything from issues with defined terms to the questionable drafting of rights and obligations. In some cases, Contract Catch will even suggest alternative language or avenues of research. You can also select a bonus Plain English Editor that will help you modernize and streamline your language. When you’re pressed for time, color-coded comment bubbles help you focus on what matters most. A patent for this unique product is pending. Interested? Subscribe to Contract Catch! All subscriptions come with a seven-day free trial. Choose a plan that best fits your needs, either monthly or, at a 35 percent discount, annually. In seconds, Contract Catch will spot issues that could have taken you hours to find on your own, if you found them at all. The rules also integrate a broad swath of case law and best practices in drafting that few attorneys have the time or the opportunity to master. Spot language that could muddy the parties' intent. Learn of inconsistencies that could be many pages apart. Find mistakes with wording, punctuation, and defined terms. Use the Plain English Editor to modernize your language. I'm glad you asked! Just click here. The president of Legal Writing Pro, Ross is an internationally recognized expert on legal and judicial writing and is the author of several bestselling books. Ross has worked with tens of thousands of lawyers and judges on three continents. Ross is a graduate of Yale, the Sorbonne, and the University of Chicago Law School. For more than a decade, he taught a drafting seminar as a Professorial Lecturer in Law at the George Washington University Law School. He has taught contract drafting and other writing topics at many companies and prestigious law firms. Together with Gary Karl, a former corporate partner and head of training at a major law firm, he is the coauthor of Deal Struck: The World’s Best Drafting Tips. He is also the author of the highly acclaimed books Point Made: How to Write Like the Nation’s Top Advocates and Point Taken: How to Write Like the World’s Best Judges. Ross is a former translator, award-winning journalist, professional musician, and lawyer at a top firm. Before law school, he completed doctoral-level coursework in linguistics and semantics. He is also a frequent speaker at international conferences and is often quoted in the legal press. Load your agreement by clicking "Catcher" on the top menu. After signing up for a subscription (you can sign up here), log in and click "Catcher" up top. If you want to activate the Plain English Editor, also click the appropriate box. 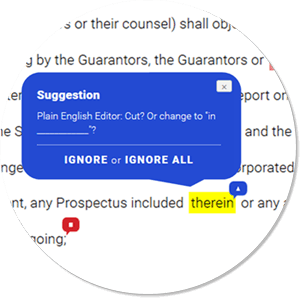 The proprietary Plain English Editor helps modernize and streamline archaic or wordy language. For example, if you start your recitals with "whereas," it will recommend that you cut such language and just jump to the recitals themselves. The default setting—with the Plain English Editor off—will limit suggestions to potentially troublesome language, inconsistencies, and possible substantive issues. 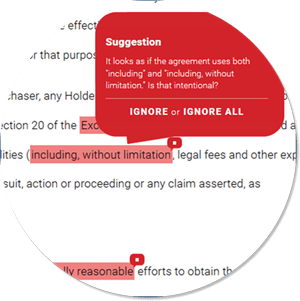 Contract Catch will apply hundreds of rules to your uploaded agreement and will generate “thought bubbles” for you accordingly. You can see the original document with the thought bubbles in your browser. No one but you will be able to see either the original document or the markup. Click on each bubble and review it. If you find the suggestion apt, leave it in place. If not, click “Ignore” to remove the flag. You can even click "Ignore All" to disable that particular rule for the entire document. Compare the original and edited versions of your document. You can choose to work on-screen or to print out your documents. If you prefer to work on-screen, we suggest that you dock your agreement to one side of the screen and the Catcher tool to the other. Working on-screen also has the advantage of allowing you to edit in real time. 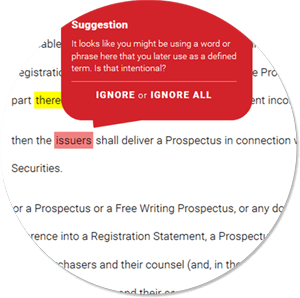 If you prefer to print out a markup, you can choose between two types: one that annotates the draft as it goes along, and another that formats the suggestions as footnotes. How should I treat the suggestions? With care and thoughtfulness. Contract Catch has many sophisticated rules, but they are just that: coded rules. No computer app can know who you are, who your clients are, or what your agreement intends. Nor are these rules infallible. You need to use your own judgment—and your substantive and jurisdictional knowledge—at all times. Are my uploaded agreements secure and confidential? We understand that both draft agreements and final agreements might be confidential, privileged, or both. We cannot and will not attempt to view or share any part of any of your uploaded documents for any reason. Do the suggestions apply outside the United States? Generally, yes, especially in common-law jurisdictions in English-speaking countries. Contract Catch knows, for example, that "best efforts" in the United States or Canada is "best endeavours" in the United Kingdom and in some Commonwealth countries. But for substantive points, you should always review the law of your jurisdiction. Where does Contract Catch come down on the shall debates? It doesn’t take a stand. It simply flags possible inconsistencies between shall and will and must, and it looks for signs that you’re using shall for provisions that are not obligations. What makes something a Plain English Editor rule rather than a substantive rule? Some drafters just need their agreements to be accurate and consistent. Others want or need their agreements to sound more modern and be easier to read as well. The Plain English Editor is designed for the second group. It flags wording that isn't wrong but is archaic, wordy, or both. Example: Using "in the event that" when you could use "if" is wordy, but it does not by itself raise a substantive issue. That’s why Plain English Editor flags “in the event that,” but the default settings do not. What if I want to disable a rule? You can choose "Ignore" to unflag flagged language, or you can choose "Ignore All" to disable a flagged rule throughout a document. What if I want to suggest a new rule, or share a situation in which a rule doesn’t seem quite right?